Neither you were your namesake, nor the other way round. The two always splinter and divide like floodwaters must at sluice gates. You to the left and imaginary friends to the right. While the natural motion between you and those old timey ghosts split and splatter remnants of rememberances on the walls that urge you so carefully, so intentionally apart. Pull up at the base of the neck and, every time, you’ll get the roots. 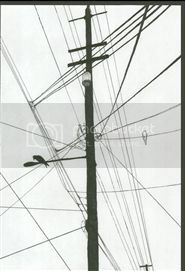 A moment to consider what and where the lines and cords and wires are drawn. At just the right height, those traps will clothes-line you dead. But the ghosts wil always remain. I have memories of bad and worse moments stuck like needles in my brain, stuck like nettles in my hands, stuffed like splinters in between the valves of my heart. Blood still flows, now more so. But up from my belly, a sickness grows out from the wrongness of it. Broken bits and barbs come off my skin like flakes brittle and peeling from the dryness of this shifting desert. I cry tears out here, but they are solid crystaline, and they cut my eyelids as they come. If you were what you could have been: we would have loved, would have slept under blankets of your deceptions, yes — but the trick is I’d never have known or felt the misery that comes from having been turned over in the dark. You might have tied the strings up first, but I’d have joined you and knotted us both in so tight we’d never get loose. But you were untethered and you slipped away like screams silent and freezing exploding into space. And I am pulled by orbits you have already escaped. The velocity between us was not so great. I discard the rotted scraps and the nasty images and the dirty ugly pieces you thought were left grafted like branches, like arms of trees ancient into me. And in the sleight of hand of true tejina, I returned to what I once loved, pitied, understood. Oh Ama-sa, you call from empty hallows and holy sacred places. Oh Ama-sa, I need you. How badly have I abandoned those calls to the cold and to the night? Would you believe it if I said, ney promised to never leave again? Your end, tragic passionate, will shake me the third and fourth and fifth time, all the same. And all the chaos you create will fall like ashen cinders at my feet. We are gods eternal, mokutan. I am fate and you are death. Burn bright for me as you disintegrate, and I will ever light your way back around. Fly me up on flaming wing and I will ever lift you closer to the sun. And in the end, we always will destroy one another. Oh, it’s an unentitled crazy sad disaster, again and again. Something like storm clouds have been hanging about the corners of rooms and the edges of ceilings these days. When I go outside, the feeling of their weight becomes less — but I do not forget. Mist and fog and the damp spring ground only do so much to pull me away, back to myself, back to the bed of reality. But within buildings and structures, those clouds still hang and as a citizen of the world, I am obligated to oblige them by oft being indoors. A member of society. A name on a record somewhere that proves I am contractually obligated to things I did not establish, did not agree to, perhaps do not want. There is no consent or volition in the contracting out of one’s will to live. A fire made by my own hands and food scorched by that very fire might help to alleviate some of this suffering. A bed made of rocks and sticks and bones. A drum and a found feather placed in my hair and the rattling of the shore being lapped by salt water. And to leave behind these clouds to rain their ash down without my head hanging about — that might be a viable solution. Who, if anyone, is willing to go? Oh, that’s right. As outlier, you accept going alone. As the crow and the raptor flies. Soon, I will spread wings instead of soothing butter on complacent bread.